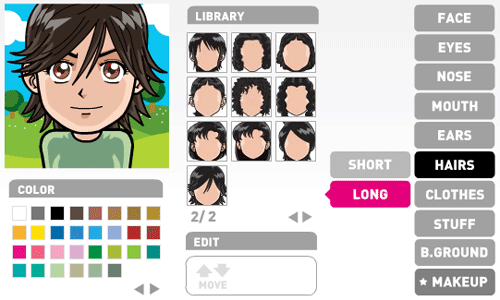 Face your manga is a flash tool allows you to create an avatar for you or your friends in a few steps. You can choose face type, eyes, nose, mouth, ears, hairs, clothes, etc which match your face features. Once you finished selecting, it will ask your email address to sent your avatar as an attachment. Download the attachment and you can use as avatar in your IMs! Cool…I will definitely check this out. create avatar versions of myself, but this is especially sick! gracias. muy bueno el aporte. You can create valid passport photos with http://idphoto4you.com website. Why this can’t run at my phone browser? well i neeed a heellp!!!!!! I saw some screenshot of the new version and it looks very nice!!! I really love that site. I always make my avatar and profile pictures via faceyourmanga. Cool post! is there any tools that convert a single image file into manga character ? hello its very good here. I always go there to make my avatar. It is a great little website. I’ve been making my avatars there since..I dunno… three years ago. I absolutely love that website.